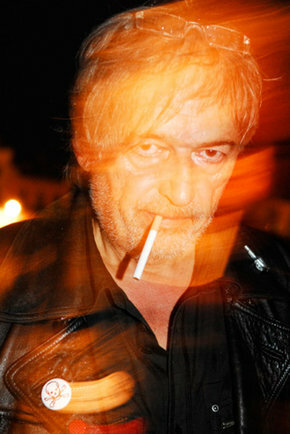 Joël Hubaut is a legendary contemporary French performance artist who never ceased to be rebel as to exist. His slogan directs his work : ”LET’S STOP TO MAKE ART ! LETS LIVE IT !”. Joël Hubaut started with contemporary art at the end of the 1960’s stimulated by the writings of William Burroughs, the music of Éric Satie, by the Vienna Actionist group, pop art and the theoretical reflections of the BMPT group (Daniel Buren, Olivier Mosset, Michel Parmentier och Niele Toroni). Mixing all these heteroclite sources he oriented his activity towards a hybrid and monstruous mixture that he himself with humour qualifies as ”Peste-Moderne”. From the beginning of the 1970’s he starts to create the first signs of his ”épidemik writing” that invades all kinds of media : objects-human bodies-vehicules-sites etc., thus developping a contaminating, rhizomic, pluridisciplinary and inter-media based process in the form of installations and performances.